Camping registration opened on March 1, 2019 for all 2018 camp site holders (an email notification was sent when registration opened). The existing site holders had until 4pm EST on March 29, 2019 to renew their camp sites. Any camp sites that were not renewed by the March 29th 4pm EST deadline were released to the waiting list. If you would like to be placed on the waiting list for a camp site, please email chris@mbpevents.com (be sure to include your phone number) or call 240-349-2538. The waiting list automatically carries over year after year. No open fires or fire pits. Dogs are permitted, but must be on a leash at all times. You must also please dispose of your dog's waste in a trash can. Campers and RV’s are not permitted to park in the regular spectator vehicle parking lots. You must purchase an RV Camping Site in advance in order to bring any RV/camper to the WCF. Conventional grills are permitted. Tow-behind commercial size grills are prohibited. Camping space includes one vehicle (RV or truck towing a camper). If you have additional vehicles, they are permitted to park in your camping space as long as they fit completely inside your designated space. 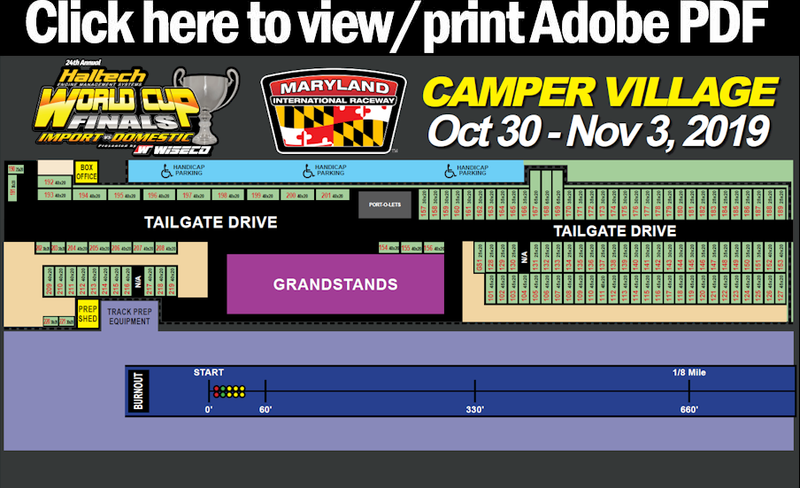 Each additional vehicle is required to purchase a vehicle parking pass at $50 each, which is good for all weekend. 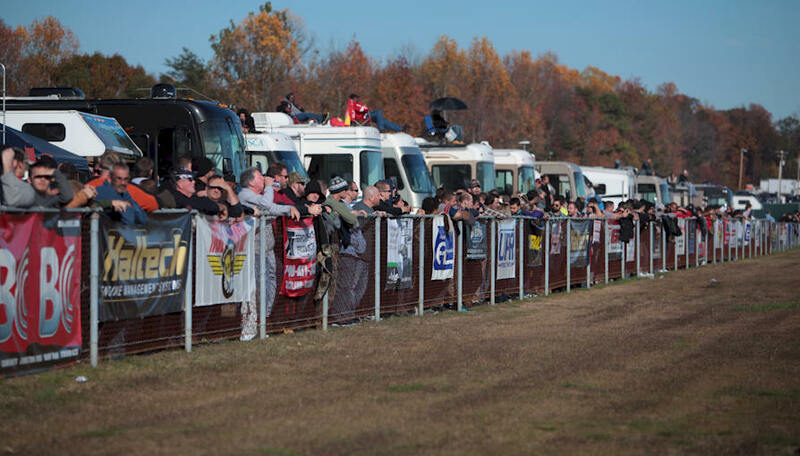 Spectators are not permitted to bring golf carts, ATVs, or other pit bikes. This is strictly enforced and you will not be permitted to bring them into the facility – so please leave them at home. Your entire camp site must fit inside your designated space. Each site is measured and marked to a specific square footage. The border of your site is the beginning of another site. There cannot be any protruding bumpers, slide outs, awnings, etc over the boundary of your camp site. Everyone in your camper must purchase a weekend wristband if you are arriving Wednesday, Thursday or Friday. We highly recommend that all campers in sites 101-127 arrive Wednesday through Friday as it will make it much easier to park since you are in the very front row. An RV dump station is available on the property and can be used free of charge. Water refill stations are also available in several different locations on the property. However, there will be a "Honey Wagon" that will be coming through the Camper Village that can empty sewage waste from your motor homes, campers and RV's on Saturday and Sunday. Their sewage service fee in your campsite is $40. They can also top off your fresh water tank for $25. Campers are not permitted to crack or empty their grey water or black water tanks for any reason. You will be asked to leave if you do. If you need electrical power, please bring your own generators as there are no campsite hook-ups. We ask that you please direct all generator exhaust fumes up over your camper by a pipe and not to the side into your neighbor's camp site. This can be done with simple tubing purchased at an auto parts store or at Lowes or Home Depot. We want everyone in the camper village to have a great time! We ask that you exercise common courtesy to your neighbors in regards to both noise and behavior throughout the event and at night.